In the summer months, my husband and I like to sit out in front of our fire pit almost every night, talking and watching the sun go down. Here in Michigan, however, we have a high number of mosquitoes, and they almost always drive us inside. Luckily, I’ve developed some unique solutions to fighting off the mosquitoes. I don’t use conventional strategies, since I hate the thought of using chemicals to rid the yard of mosquitoes, and I don’t want to expose my family and friends to the toxins in bug bombs. The CDC studied indoor pest bombs and found that exposure to the chemicals can lead to health problems. These chemical bug repellents can cause nausea, shortness of breath, headaches, and many other severe symptoms requiring hospitalization. In light of this, I wanted to highlight some natural mosquito and bug repellents you can use in your home or in your yard in place of traditional bug sprays and chemicals. Many herbs naturally repel mosquitoes. You’ve likely heard of citronella, but did you know that garlic, lemongrass, cedarwood, basil, eucalyptus, lavender, peppermint, rosemary, thyme, onions, and marigolds also deter the little buggers? You can cut down on the mosquitoes in your yard by planting these herbs around your porch and deck. In addition to growing the herbs, throw some on the grill when cooking outside. Burning herbs while you cook can significantly reduce infestation during the dinner hour. Many people turn to products like OFF! or repellents that contain DEET to ward off mosquitoes. These products, especially those that contain DEET, can cause health problems. BeyondPesticides states that DEET kills large numbers of brain cells in the cerebral cortex; this is the area of the brain that controls muscles and movement. You should not spray or rub this chemical onto your skin. Use safe products, like Avon’s Skin-So-Soft, or use natural essential oils from the herbs listed here. You can find essential oils at most natural health food stores or online. Simply dilute a few drops in a carrier oil, such as olive oil or Vitamin E, and rub the oil onto your skin. You can also make an herbal blend to spray on your skin. Add 25 drops of the essential oil of your choice to 1/4 cup of water. Shake it up inside a spray bottle, and spritz it on your skin, for a healthy and natural bug repellent. Reapply oils and sprays throughout the evening, to ensure they remain effective. You can also burn diluted essential oils outside in an aromatherapy diffuser. Remove standing water from the trays under flowerpots, or on car or boat tarps. If you have a drainage ditch that habitually fills with water, do what you can to clear it out so it drains quickly, before mosquitoes begin to spawn in the standing water. You’ve likely seen citronella candles for sale at the home improvement store. Citronella candles can help keep mosquitoes away. In addition, candles made from herbs that repel mosquitoes can also keep bugs away from your deck or yard. Look for candles that include essential mosquito-repelling oils like cedarwood, lavender, lemongrass, and rosemary. Place the candles on tables and around the deck or yard to help reduce infestation. If you have a plug-in, refillable mosquito killer, you don’t have to keep buying the toxic inserts to kill the mosquitoes. You can easily make your own inserts using an orange peel. Orange oil repels bugs naturally, and many mosquito and bug sprays include it. Cut an orange peel to the exact size of the rectangular inserts normally used in the mosquito plug-in device. Then, use the peel in place of the insert. Your home smells great when you use an orange peel bug repellent and stays bug-free. Plus, you won’t have to worry about breathing in toxic chemicals. Many people don’t know that used coffee grounds can help keep mosquitos at bay. Not only is this an eco-friendly alternative, but it’s a great way to reuse coffee grounds! You can sprinkle the grounds around your deck or patio, or put them in bowls and place them near where you’ll be sitting. Mosquito coils are slow-burning incense that you set on the ground near where you’re sitting. The cool thing about mosquito coils is that they’re natural; they’re made with pyrethrum powder, which is a powder made from the dried heads of Chrysanthemum flowers. Mosquito coils are often used in Asia and South America, but you can often find them in hardware stores. You don’t have to stay inside during mosquito season. 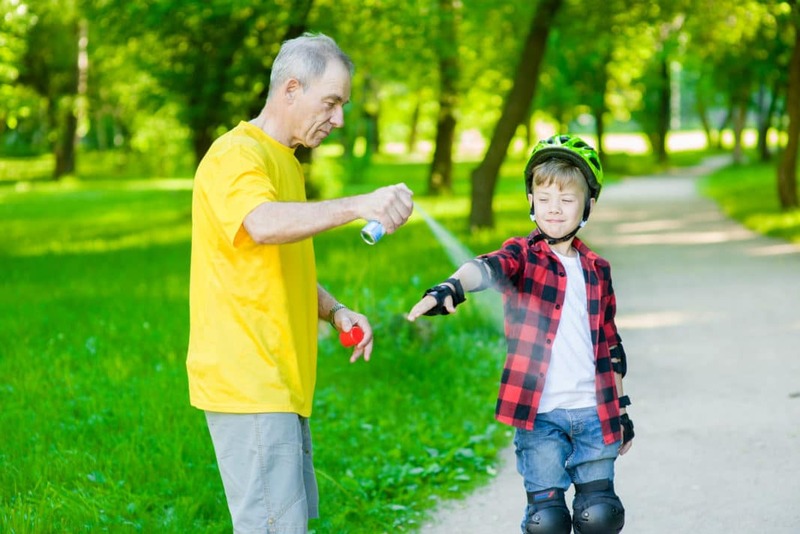 In addition to the ideas outlined here, you can search online for all-natural, DEET-free bug repellent. A variety of companies provide all-natural bug repellent products created with essential oils including cedar, cinnamon, citronella, lemongrass, and orange oil. Put on a lightweight, long-sleeved shirt before heading outside, to help eliminate bug bites, and try to avoid sitting outside for prolonged periods during times of heightened mosquito activity. Use natural remedies in and around your home to repel mosquitoes and allow you and your family to enjoy a safer, healthy summer. Do you have a favorite all-natural bug repellent? What works best for you in keeping the bugs away during the summer months?